These is similar to the trip I made the other day – a good friend of mine gave me some of her extra Kraft coupons from the What’s Cooking Magazine from the Kraft Samplicious Box. Since they expire tomorrow I thought I better hurry and use them. I combined them again with the save $5 WUB 5 from Save on Foods (I bought 10 Kraft Products and used two of these). I didn’t have coupons for everything *gasp* but I thought they were decent prices anyway. We are very well stocked for Christmas now, guess I better hurry and start inviting people over to eat it all! All the coupons I used came in the Kraft box – other then the Save $5 when you buy 5 – Save on Foods had those in store. I thought I was out of Scrubbing Bubble stacks but I found one when cleaning up my coupons AND Save on Foods had more in stock! Woot! Getting food feels really good, I love getting cheap hair and body products but they is just something extra awesome about food – even if it is just a ton of crackers lol. 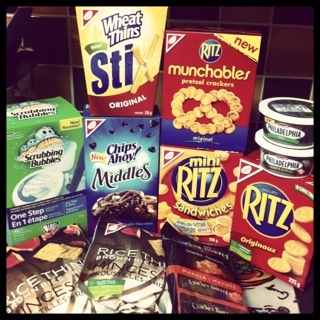 This entry was posted in canadian coupons, coupon stacking, coupons, food, free, save on foods and tagged canadian coupons, coupon stacking, coupons, food, kraft, save on foods on November 24, 2011 by Courtnie. 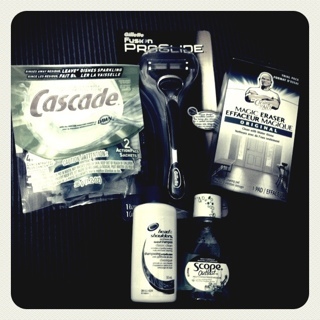 Got my P&G brandSAMPLER from Costco yesterday! I was starting to think this might never come. It is very similar to the regular P&G brandSAMPLER that I received a few weeks ago. Both of these offers are no longer available but I will post when they are live again. The Costco one was defiantly better then the regular one. I really love these sample boxes. This entry was posted in free, freebies, samples and tagged free, free samples, freebies, samples on November 24, 2011 by Courtnie.